Working at the Museum is my first step. Taking over the world is step two! Summer is the time of the year for ice cream cones, endless days at the pool, shorts and flip-flops. It’s that warm season when we all forget about work and just relax. That’s how most people feel about summer, including me, until this year. 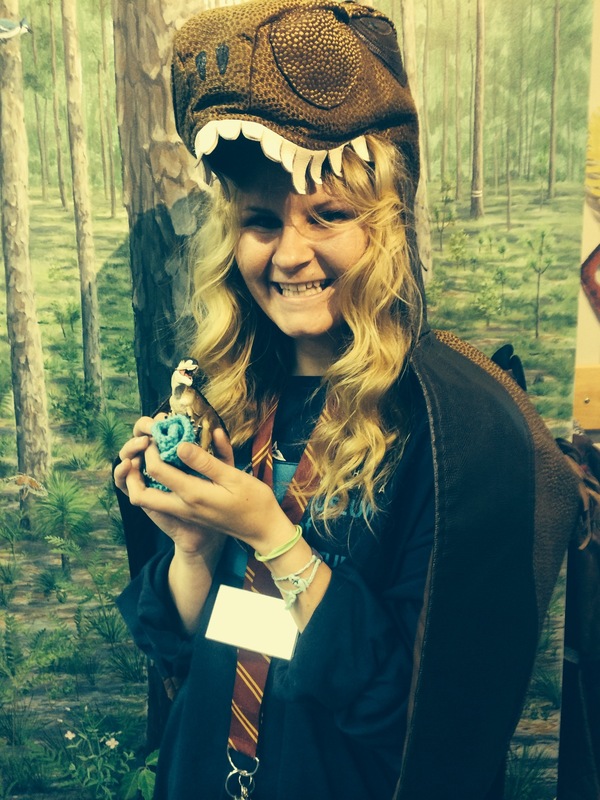 For the past three months I’ve been working as an exhibits intern at the North Carolina Museum of Natural Sciences. It isn’t the run of the mill internship, with part-time hours and sleeping on the job. 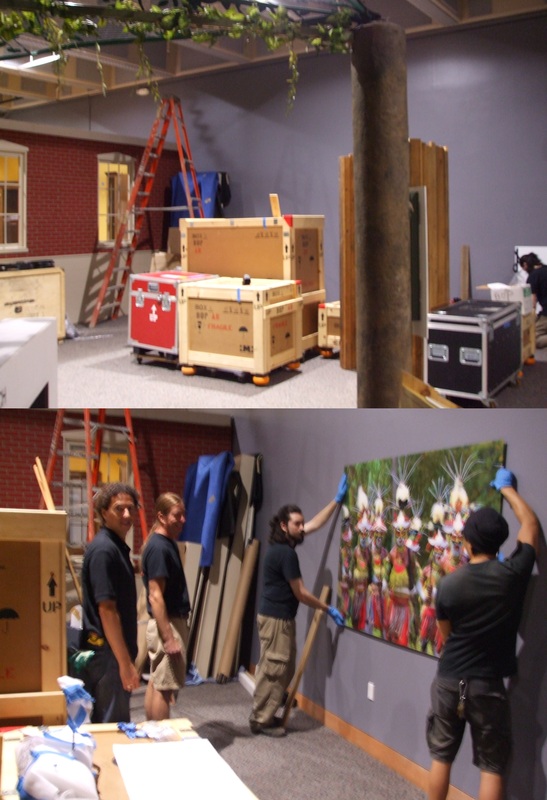 The Exhibits Department always keeps you on your toes, consistently working to ensure everything in the Museum is working properly. I didn’t know how much work there needed to be done, but in all honesty, it never ends. To some people, this might be mind-racking to never have a moment’s peace, but for Exhibits it is just a typical day. The whole department is composed of individuals who not only are great at their respective jobs, but are truly delightful people. I’m greeted every day with warm smiles and kindness. The whole building makes me feel appreciated for all that I do, every day I come into the Museum. It’s a great feeling to be appreciated by others, and makes working a full time week that much more enjoyable. And working here is enjoyable no matter what’s the daily task. There have been days of meetings, research, reading, survey development, observational studies, administering surveys, survey analysis, reports, decorating rooms, fixing exhibits, helping visitors, and a bunch of other random activities that I’ve worked on to keep myself entertained. There never is a dull moment, for there is always more work to be done. 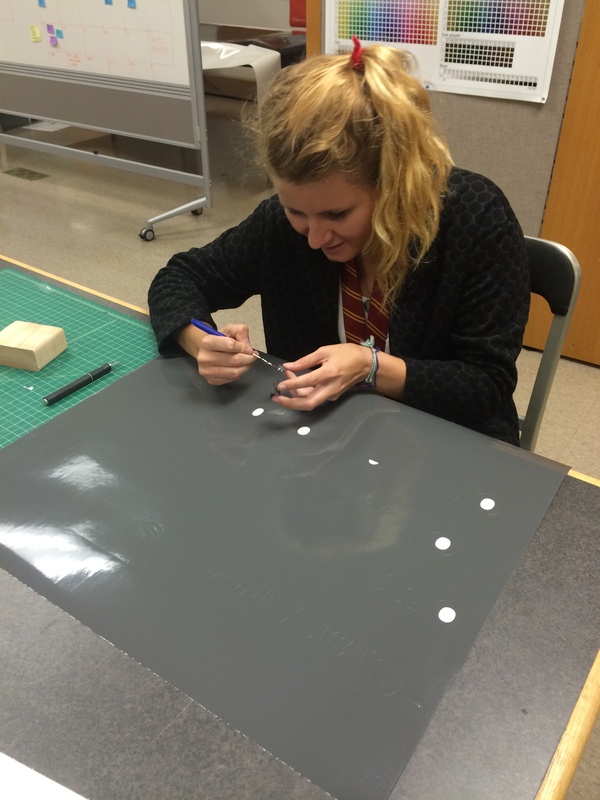 One task of many: Help produce vinyl letters for signs around the Museum. After the signs are ready, I also get to install them! Some the work might seem strange, but I never question these assignments. 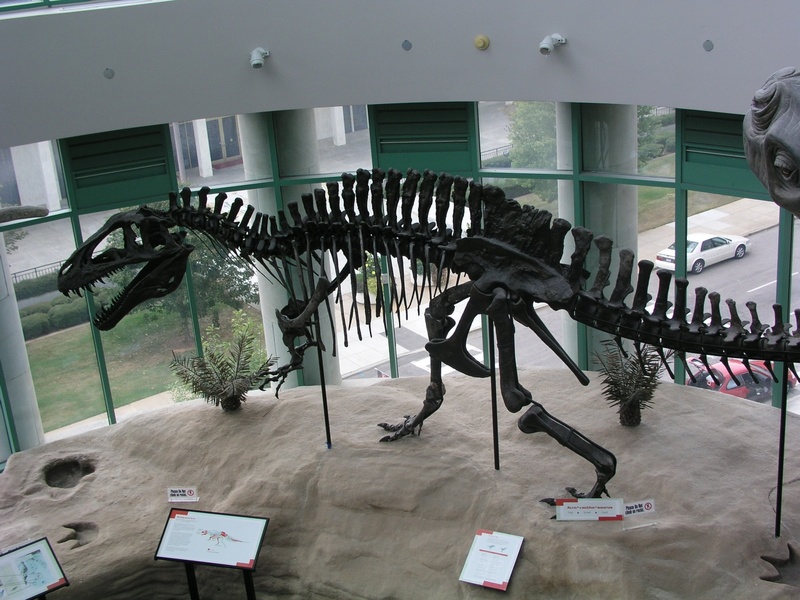 The most exciting of these tasks would be “Adventures with Acro.” Acro is short for Acrocanthosaurus, which is the near-complete dinosaur skeleton housed on the third floor of the Museum. To help promote some of the current online evaluations, I photographed the model version of Acro touring the Museum, which was used for various “live tweets” encouraging people to take our survey. The adventures did not stop there; Acro now travels with me all over the East Coast to help promote the Museum in different places. Acro and I became good friends this summer. 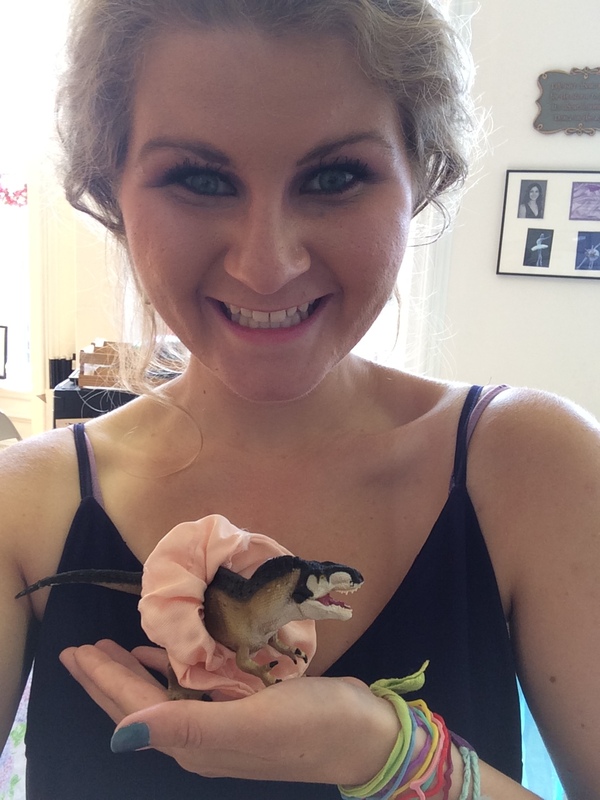 Acro feels more at home when I wear a dinosaur costume. 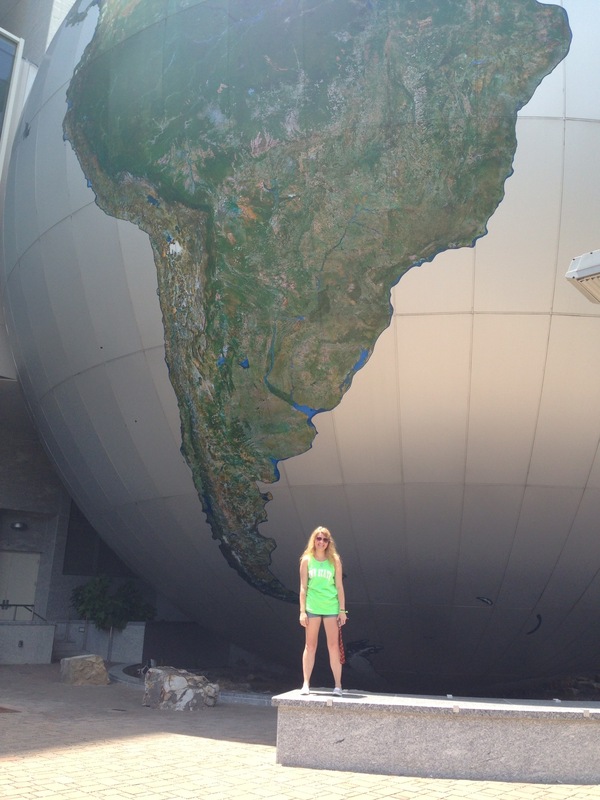 While touring with Acro was my favorite summer task, it is shadowed by the love I have for my favorite part of the massive Museum. This would be the Museum’s very own two-toed sloth, and given that he did not have a name, I took the responsibility of naming him Bernard. Many lunch breaks I would disappear from my post to watch the cute little guy sleep or climb his tree to eat food. The work day was never complete without stopping in to say hello to my favorite creature, which in turn made every day that much better. 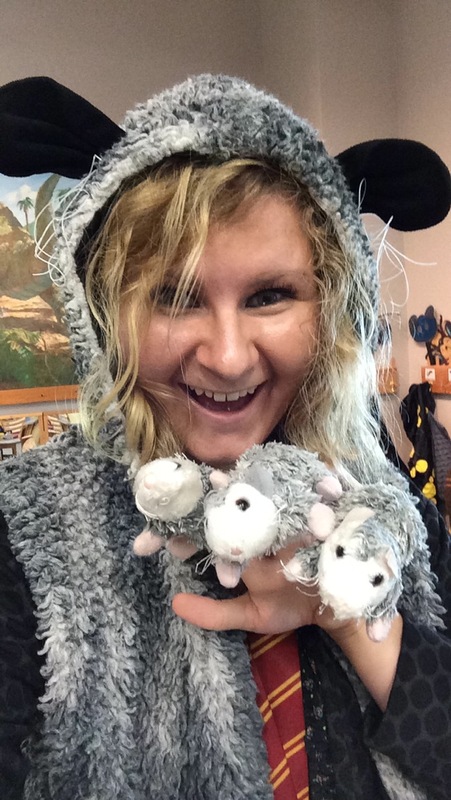 Is there another job where you can dress up in a possum costume and NOT get strange looks? The overall experience has been indescribable; I’ve never enjoyed working as much as I have this summer. I am one of the few who likes to come to work every day and misses it on days I have off. It is a truly magnificent place, and I’m so happy to have been given this opportunity to work here. Almost exactly a year ago, a chunk of rock the size of a Sperm Whale came roaring into our atmosphere over Russia. It exploded fifteen miles above the Earth’s surface, creating a brilliant fireball in the dawn sky and a shockwave that shattered windows across six cities. Bits of rock from the blast, mostly the size of gravel, rained down into the snow after the explosion. The largest fragment, weighing more than a thousand pounds, landed in a nearby lake and was recovered by divers months later. The meteor lit up the predawn sky on February 15, 2013. Photo by Alex Alishevskikh (via Flickr). But the rocks’ journey didn’t end there. Three pieces of the meteorite have arrived in Raleigh, just in time for Astronomy Days. We’ve added them to the impressive collection already on display in our “Postcards from Space” exhibition. It took a bit of shuffling to get everything displayed properly, but we made room! Moving part of the existing collection to its new home. I knew it! He was framed for building that new graphic! In the upcoming 2014 Winter Olympics in Sochi, everyone who wins a gold medal on the event’s anniversary, February 15, will also receive a medal embedded with a piece of the meteorite. Though the entire meteor event lasted just a few minutes, in that time the same piece of falling rock went through two name changes. In space, it was an asteroid. Once its burn-up became visible in the atmosphere, it became a meteor. When its broken-up remnants hit the ground, they became meteorites. Even more confusingly, the rock was never a meteoroid; those are bits of rocks in space smaller than asteroids but bigger than micrometeroids. Confused yet? So were we. Here’s a fun little animation that will help (just know that this is for a smaller object than the one that exploded over Chelyabinsk). There’s a Church of the Chelyabinsk Meteorite. Really. On the same day as the event, the astronomy world was watching a different asteroid. That object, with the catchy name 367943 Duende, passed close to Earth (closer than the orbit of some satellites!) but ultimately missed us. Weirdly, the two asteroids were completely unrelated. You can keep tabs on wayward space rocks by following NASA’s Near Earth Object Program. Most of the injuries from the explosion were caused by flying glass, but a few people were actually sunburned by the meteor’s intense light. 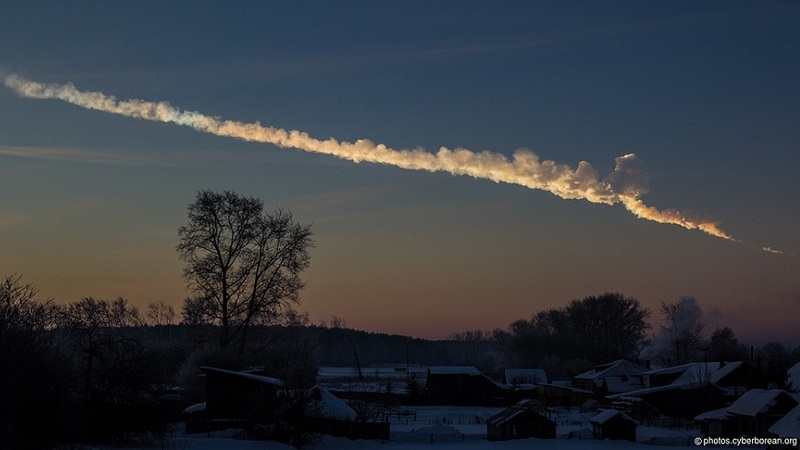 The exploding meteor created a plume of dust that traveled around the Northern Hemisphere and all the way back to Chelyabinsk within four days of the event. Three months later, NASA scientists could still detect a persistent belt of dust around the planet. Come check it out on the third floor of the Nature Research Center! 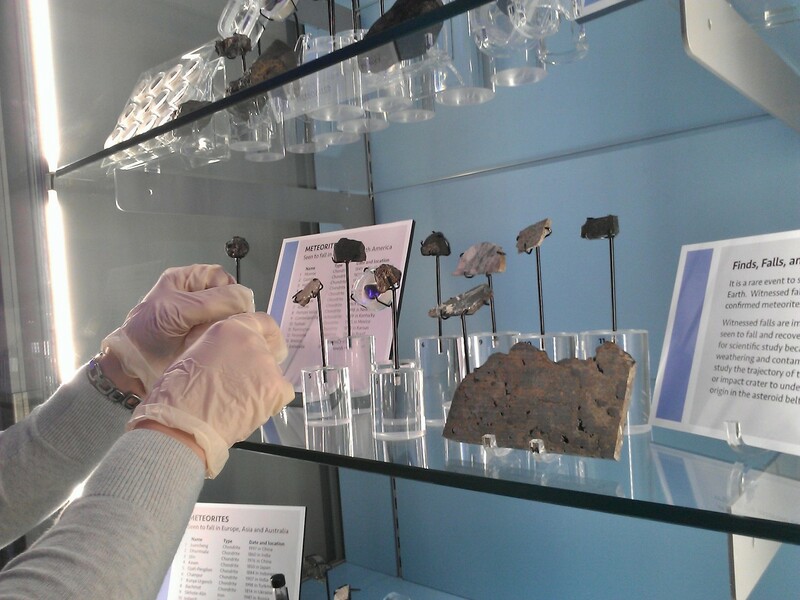 The meteorite fragments, along with a commemorative medallion, will be on display for at least the next year. Think it’s cold outside now? About 18,000 years ago, this might’ve been a typical winter day in North Carolina! During the last glacial maximum (what most folks refer to as the last ice age), ice sheets extended from the Arctic to as far south as New York City. Though North Carolina was warm enough to be blanketed with forests, not ice, it wasn’t exactly the “Land of the Longleaf Pine” that we know today. Instead, spruce-fir forest covered the state. As the cold and glaciers retreated, so did the spruce-fir forest … mostly. You can still find pockets of the old, cold forest atop our highest peaks. Only in pockets, though, because the warmer climate in the valleys means that the spruce-fir ecosystem doesn’t thrive at lower elevations. Going up effectively means going north; for every thousand feet of elevation you gain, the temperature drops as much as if you’d headed 300 miles north. Can you guess which of these forests is in Canada, which is in North Carolina, and which is in our “Mountains to Sea” exhibition? Mouseover for the answers. These little islands of spruce-fir forest have been isolated from one another for tens of thousands of years now. In that time, each pocket of forest has become its own little world, sometimes hosting unique animal species on one peak that aren’t found even on the next peak over! You can visit these “islands in the sky” and check out their fantastic biodiversity without having to brave the bitter cold. Come visit the mountain cove we have on the third floor of the Exploration Center (a.k.a. the “old” building), in our “Mountains to Sea” exhibition. Today’s high temperature atop Mount Mitchell is only 5 degrees Fahrenheit, with a wind chill near 20 below, but the forecast for our exhibition is 70 degrees all day. Our newest exhibition, Birds of Paradise: Amazing Avian Evolution, landed in the special exhibition gallery this week. To prepare for its opening this past Sunday, October 13, we’ve been busy getting the gallery ready, unpacking the crates, and putting it all together. A tiny slice of the installation work happening over the past week. Birds of Paradise is an exhibition all about these strange and wonderful birds and how researchers study them. Through sexual selection, birds-of-paradise have evolved incredible and sometimes downright bizarre plumage displays and courtship dances, sometimes looking more like fantastical sculptures than living creatures. Think peacocks turned up to eleven. The exhibition grew out of a collaboration between an ornithologist and a nature photographer, so it’s beautiful as well as scientifically rich. 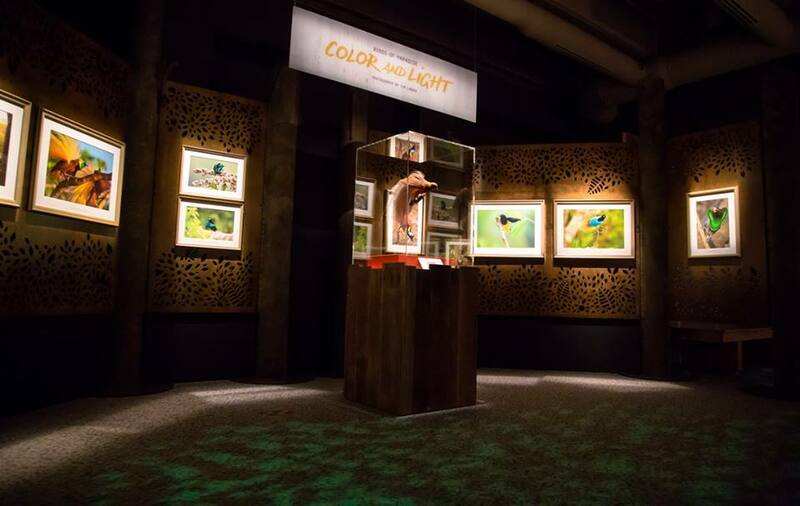 One of the most striking parts of the exhibition, at least in my opinion, is a simple art gallery that showcases Tim Laman’s photographs of different birds-of-paradise species. The birds are so fabulous that they stand out without any interpretation. A shot of the gallery mostly assembled. The finished product. Photo by Matt Zeher. That’s not to say that there isn’t plenty to learn and do inside the exhibition. 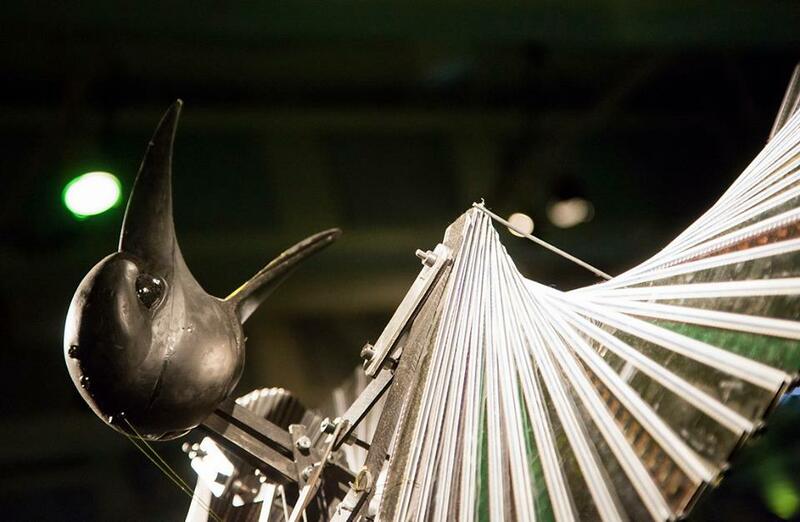 Come visit and you’ll be able to watch an oversized riflebird sculpture do its courtship dance, and you can even try a dance yourself at the motion-sensing “Dance, Dance, Evolution” station. 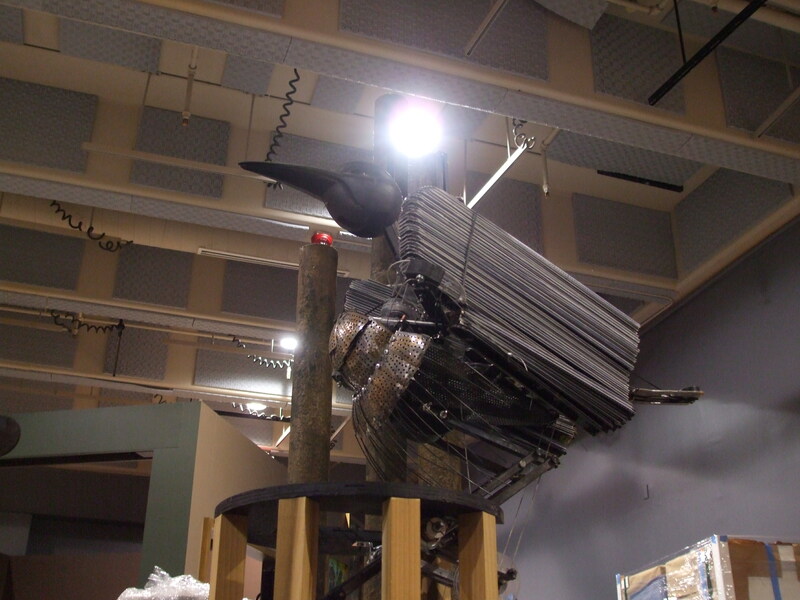 The riflebird sitting dormant during installation. A riflebird action shot after opening. Photo by Nik Swain. Students test out their dance skills. Photo by Nik Swain. Another part of the exhibition is dedicated to the research tools and techniques ornithologists use to study these birds. At one station, you can marvel at the complex setup researchers used to observe a male bird-of-paradise’s dance from a female perspective. Click on the image to watch the video at the New York Times. We haven’t always had such sophisticated tools at our disposal. 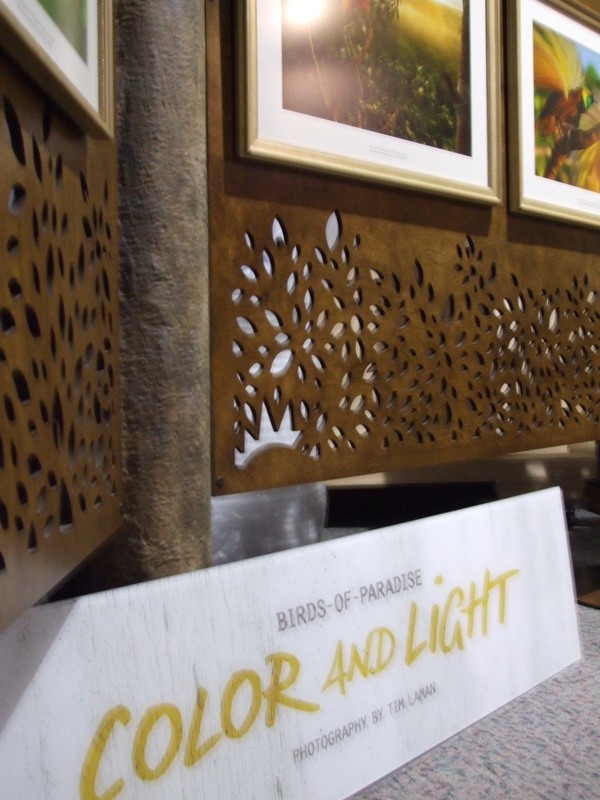 A different section of the exhibition is dedicated to the ways we studied and used birds-of-paradise in the past. Not only were they collected for science, they were widely hunted for plumage to decorate hats during Victorian times. A quick look around the exhibition or at the feather gallery on the Birds of Paradise project home page can tell you why. Though the large-scale feather trade has ended for conservation reasons, bird-of-paradise feathers are still used on a small scale by native New Guinean peoples for ceremonial wear today. 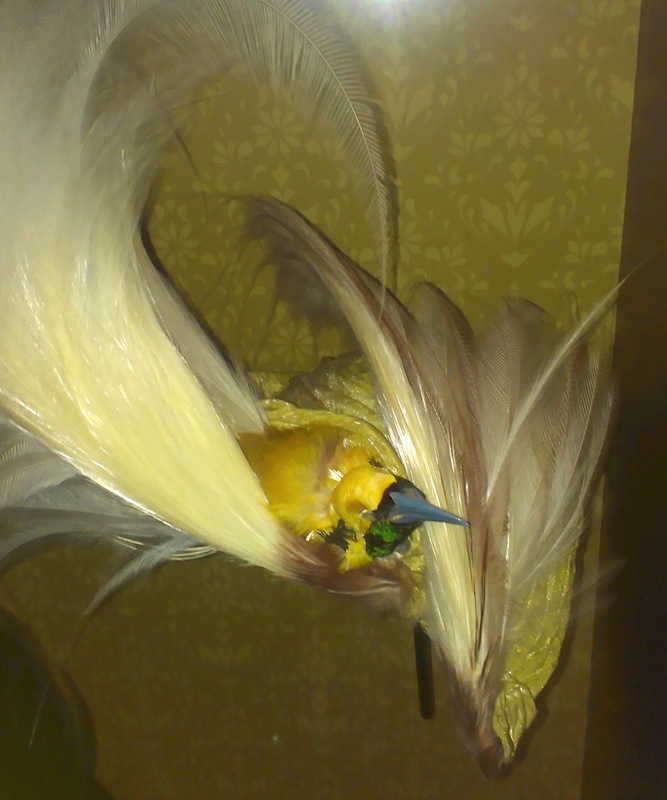 You can see examples of headdresses and hats decorated with birds-of-paradise feathers in the exhibition. Not exactly an everyday sort of hat (I promise there actually is a hat there somewhere underneath all the feathers). The exhibition will be here through March 23, 2014. Admission is free for members, and only $6 (for adults), $5 (for seniors, students, and military), or $4 (for children 3-12) for everyone else. You can get tickets at our box office, or in advance online. Come check it out! We’d love to see you there. They’re ready for their close-up! Photo by Jason Means. We’ve got another newsworthy sign up in our exhibit halls. This time, we’re talking about periodical cicadas. Whether you’ve found your way here from our QR code or by other means, welcome! This summer, the East Coast is playing host to Magicicada sp. members of “Brood II,” one of 15 groups of periodical cicadas that emerge together in huge numbers once every 13 or 17 years. 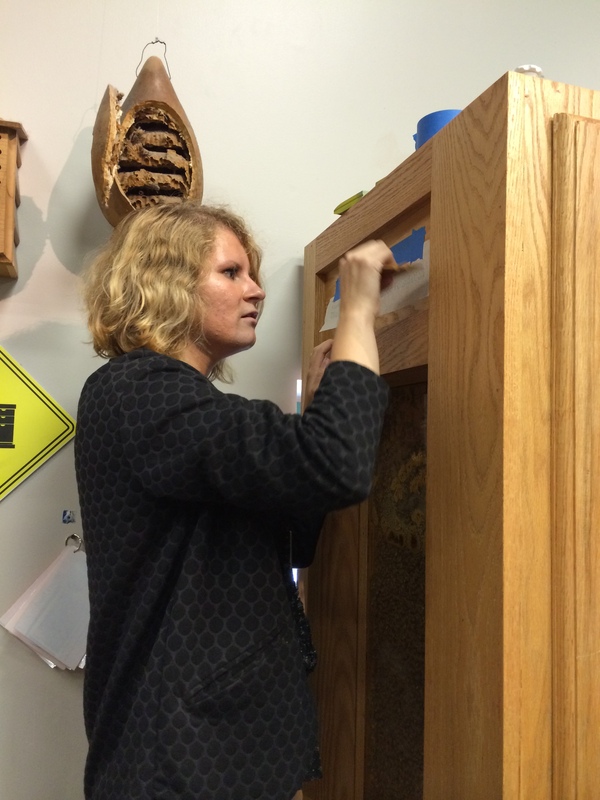 Brood II bugs emerge in 17-year cycles. There are five broods of 17-year cicadas in North Carolina and one brood of 13-year cicadas, though no single brood covers the entire state. Where can we expect to see this year’s swarm? The News & Observer ran a handy map with their article about the cicadas’ emergence, which featured Museum entomologist Bill Reynolds. If you’re not in Brood II’s range, you might be wondering where cicadas will emerge next. The New York Times has an interactive tool showing the distributions and cycles of all 15 broods. You can use it to forecast cicada emergence up to the year 2030, or go back in time all the way to 1893, when brood numbering first began. Spoiler alert: North Carolina won’t see periodical cicadas again until 2017, when the 17-year Brood VI invades the mountains. Even areas near big cities like New York, Washington D.C., and Philadelphia aren’t immune from the cicada hordes. These maps aren’t always the most accurate, though, since land use changes (especially the development of former forests) and other factors can diminish cicadas’ numbers in some areas — not to mention that the maps themselves are often based on rough sketches that are almost a century old. At least two projects are underway to update the maps: one sponsored by the National Geographic Society, and another citizen science project led by WNYC’s Radiolab. The Radiolab project site has instructions for how you can build your own soil temperature sensor, to see if soil temperatures are warm enough in your area for the cicadas to emerge. If you’re interested in learning more about periodical cicadas’ unique life cycle, the site magicicada.org has tons of information about all seven species. For a more narrative look at their oddities, definitely check out Carl Zimmer’s column in the New York Times. One of the most fascinating things about cicadas’ life cycle — and a fact I didn’t know until I started researching this project — is that periodical cicadas are actually active underground for the full 17 (or 13) years of their cycle. That means this year’s adult cicadas were born in 1996. They’re old enough to graduate high school! If the idea of having your yard overrun with a bunch of teenaged insects eager to mate isn’t particularly appealing to you, well, unfortunately there’s not a lot you can do except wait it out. Unless you’re feeling adventurous, in which case I recommend you check out the University of Maryland’s “Cicadalicious” cookbook, found here (it’s a PDF). There are lots more sources on the web for cicada recipes, but I’ve found this to be the most comprehensive, including treats such as soft-shelled cicadas, cicada tacos, and southern cicada tartlets. Why wait until the Museum’s next BugFest to enjoy some exoskeletoned goodness? In the News: Does Extinction Have to Be Forever? 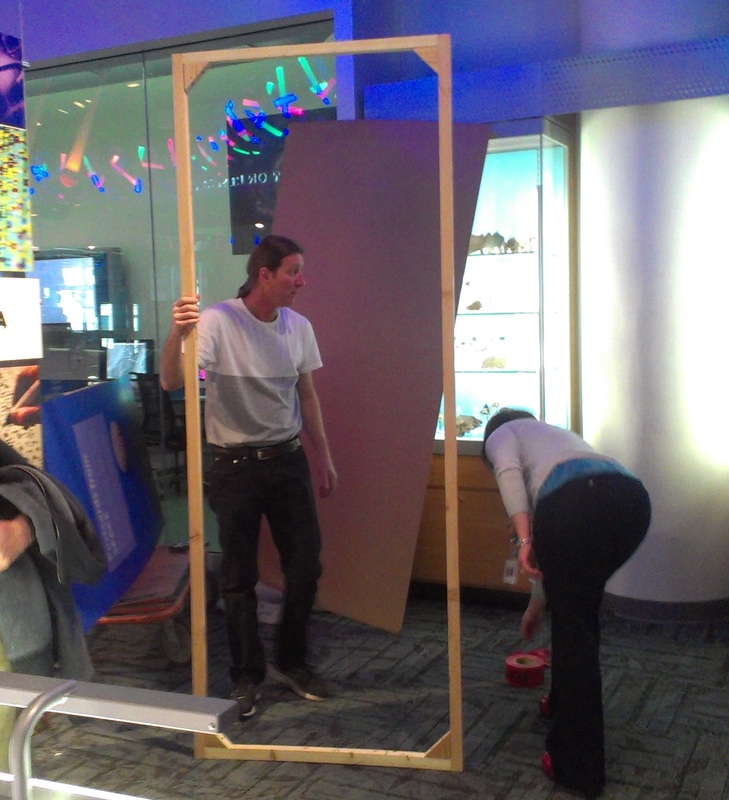 We’ve started a new experiment in the exhibits! Today we set up the first label in an ongoing series of temporary labels and complimentary blog posts, “In the News.” We’ve blogged before about how tricky it can be to keep the labels on the floor up-to-date with emerging science, and this is our latest effort at doing just that. First up is a fascinating and controversial topic: using technology to bring back extinct species. 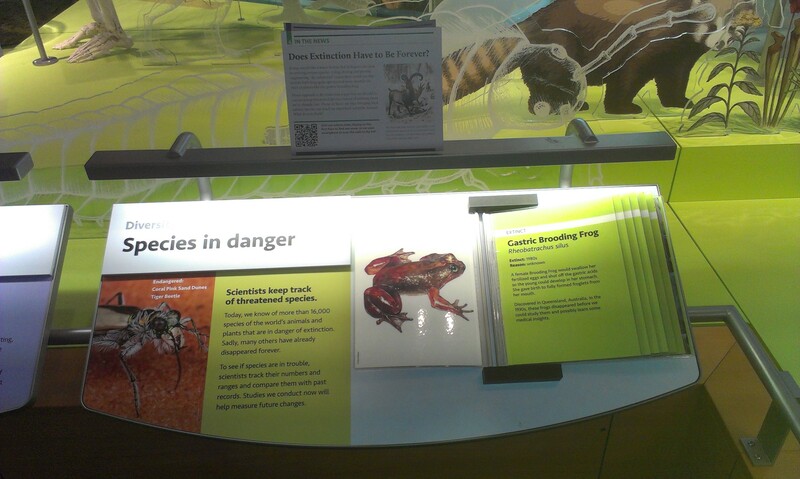 You can find our new (and temporary) label perched on one of the reader rails in the Biodiversity exhibit, on the second floor of the Nature Research Center. Perhaps you’re coming to us from the QR code in the exhibit itself, or perhaps you found your way here just because you’re interested in learning more about “de-extinction.” Either way, welcome! The whole de-extinction party in the news was kicked off by National Geographic. They hosted a one-day TEDx conference on March 15, with synthetic biologists and conservationists and plenty of others speaking about their research or opinions about the idea. National Geographic also dedicated their April issue to the topic. For a great overview of the science and the ethics, start with Carl Zimmer’s feature piece. The notion of bringing vanished species back to life—some call it de-extinction—has hovered at the boundary between reality and science fiction for more than two decades, ever since novelist Michael Crichton unleashed the dinosaurs of Jurassic Park on the world. For most of that time the science of de-extinction has lagged far behind the fantasy. Gina Kolata at The New York Times also has a newsy overview of what was discussed at the conference on March 15. Until recently, the arrow of natural selection seemed to go only one way. A species could form, then it could flourish, then it could go extinct. And once it was extinct, it could not come back. Now, though, some scientists say they see a new path. “Maybe we can no longer delay death, but we can reverse it,” said George Church, a Harvard Medical School geneticist. One last newsy look before we get to opinions: David Biello reported on the conference for Scientific American. While tadpoles may be a long way off, let alone a viable frog, the southern gastric brooding frog might be the first species brought back from the dead permanently. The first de-extinction happened in 2003, although it lasted all too briefly. Scientists coaxed a clone of an extinct ibex from Spain to birth from a special hybrid goat. But the cloned bucardo bore a third lung and couldn’t breathe properly, dying within 10 minutes. Although this early effort failed, the growing cohort of resurrection projects raises a central question: Does extinction mean forever, anymore? If not, do we have an obligation to bring species back? “If it’s clear that we exterminated these species, we not only have a moral obligation to see what we can do about it but a moral imperative to do something if we can,” Archer argued. The new science of synthetic biology aims to make it possible for him to fulfill that moral imperative. Scientific American also has a super cool video up about one of the species being targeted for de-extinction, the gastric brooding frog. Ed Yong also took a look at the gastric brooding frog on his blog, Not Exactly Rocket Science. Archer’s goal is simple: To bring the extinct gastric brooding frog back from oblivion and, in doing so, provide hope for the hundreds of other frogs that are heading that way. Getting the embryo was a milestone and Archer is buoyantly optimistic that he’ll cross the finish line soon. Lazarus, he says, will rise again. It’s not all frogs, though. Here’s a piece Ed Yong wrote some time ago on his blog about resurrecting the wooly mammoth. Tens of thousands of years ago, woolly mammoths roamed the northern hemisphere. These giant beasts may now be extinct, but some of their bodies still remain in the frozen Arctic wilderness. Several dozen such carcasses have now been found, and some are in extremely good condition. Scientists have used these remains to discover much about how the mammoth lived and died, and even to sequence most of its genome. But can they also bring the animal back from the dead? Will the woolly mammoth walk again? Now it’s opinion time. Stewart Brand wrote enthusiastically for continuing de-extinction work in National Geographic. Humans killed off a lot of species over the last 10,000 years. Some resurrection is in order. A bit of redemption might come with it. Stuart Pimm at Duke, however, isn’t a fan. You can read his views in an editorial for National Geographic and a Q&A at the Duke Chronicle. De-extinction intends to resurrect single, charismatic species, yet millions of species are at risk of extinction. De-extinction can only be an infinitesimal part of solving the crisis that now sees species of animals (some large but most tiny), plants, fungi, and microbes going extinct at a thousand times their natural rates. And it sounds like Keith Kloor, writing at his blog Collide-a-Scape, isn’t quite sure yet. Ecologists and conservationists seem divided, though. A group of them expressed their enthusiasm in a 2005 commentary in Nature; others, such as the prominent conservation biologist Stuart Pimm, argue forcefully against the “de-extinction” proposal. Finally, Brian Switek explains that we might not be bringing back the species we say we are, at least not as they really were, in a piece at his blog, Laelaps. De-extinction, in the strict sense of trying to resurrect creatures just as they were, appeals to a simplistic sense of environmental justice. Through cloning, tweaking genes, and other procedures, synthetic biologists suggest that they can recreate long lost creatures and pop these revived lineages right back into suitable habitats, therefore restoring some semblance of ecological equilibrium. New inventions will restore some semblance of nature untrammeled and undisturbed by human presence, according to such visions, which is preferable to the compromised ecological hodgepodge that surrounds us today. That’s how de-extinction is marketed, in any case. The fact of the matter is that revived species would be more akin to carefully-assembled replicas that fit our vision of what those lost creatures were like – living odes to our best conception of what that animal was actually like. What do you think about the idea of de-exinction? Do you have any favorite links about it to share? 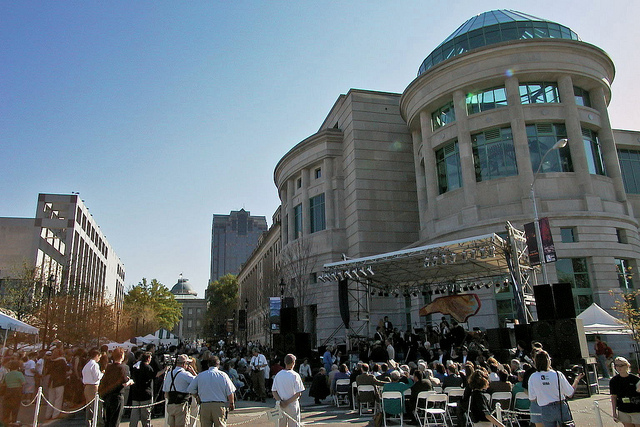 Starting today, the Triangle (and the Museum) will be invaded by the 2013 Science Online conference, an annual event where participants explore the intersection between science and the web. 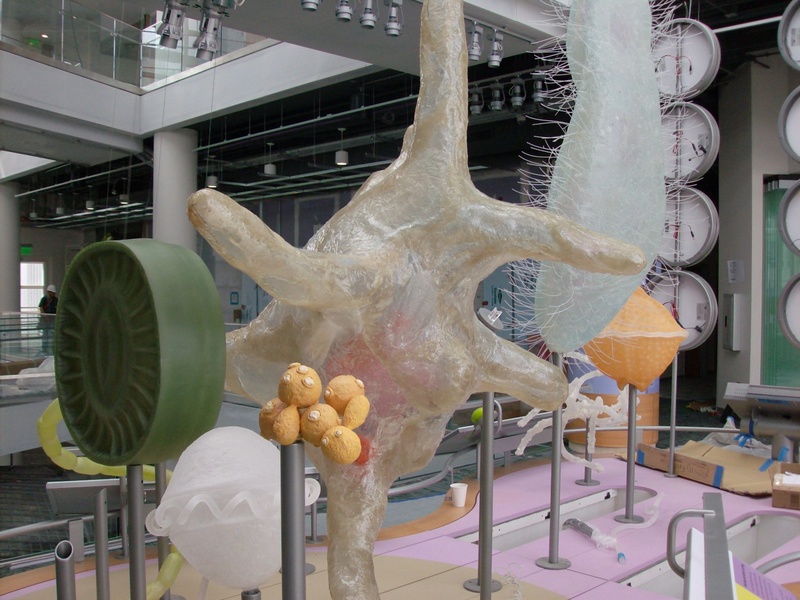 Whether you’re here for #scio13 or not, here’s a geeky museum tour we think you’ll enjoy. Appropriately for a group of internet-focused folks, it’s got more web links than you can shake a mouse at. Start your geektastic tour at the Main Building’s entrance, on Jones Street across from the North Carolina History Museum. As you enter, breeze right on past the front desk and box office – admission has been free since the museum opened more than a century ago. Hang a right into the Coastal North Carolina gallery. Since so many #scio13ers are visiting from out of state (or even abroad), it’s worth taking a bit of time to see the rest of North Carolina, at least a simulacrum of it. 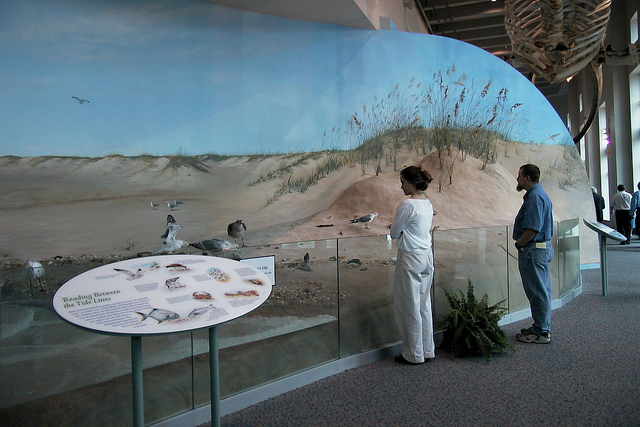 The coastal gallery has some awesome dioramas of life on the Carolina coast and lots of cool information about the forces that shape it. Don’t miss the bioluminescent vomiting shrimp that captivated Brian Switek last year! Head upstairs into the Mountains to Sea gallery. Continuing our Raleigh-based tour of North Cackalacky, take some time to wander through a longleaf pine forest. Longleaf pine forests used to cover much of the state, but after centuries of exploitation and fire suppression, now they only exist in isolated patches. 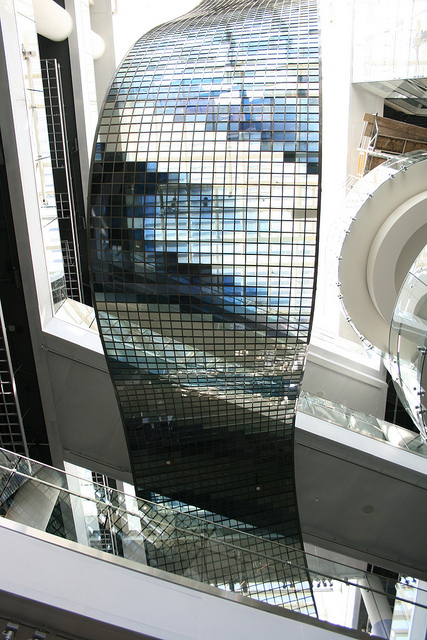 While you’re here, keep an eye out for the pickled trees, and don’t miss our two-story mountain waterfall. Travel to the third floor and visit Acro, a.k.a. the Terror of the South. No, it’s not a T. Rex. It’s way cooler than T. Rex. The skeleton in front of you is the only real Acrocanthasaurus atokensis on display in the entire world. Not only that, it’s the most complete Acro specimen ever found. Be impressed. Be very impressed. The Acro gallery also illustrates an important lesson in communication – meet your audience where they’re at. The way the gallery was originally designed, almost all our visitors came away believing they’d seen a boring old T. Rex. After an evaluation to identify the problem and a set of redesigned signage, more visitors understand just how special the fossil in front of them really is. Cross the Mountains to Sea overlook and meet our snakes. For bonus points, head up to the fourth floor. 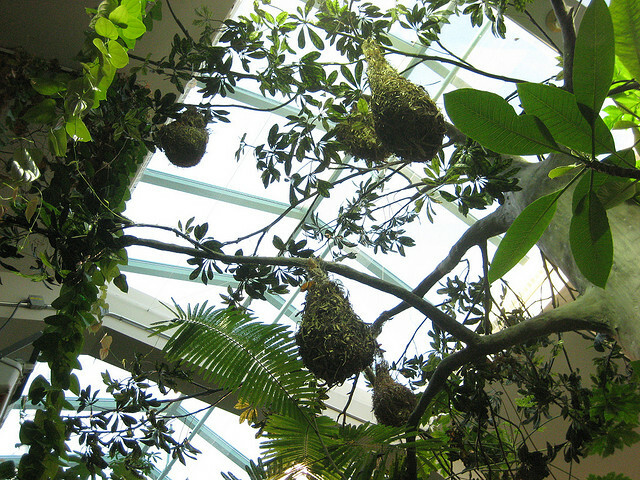 Check out the Arthropod Zoo and meet our sloth in the Living Conservatory. Because honestly, when was the last time you were outside and saw some wildlife? Your pets don’t count. Neither does the wildlife of your body. 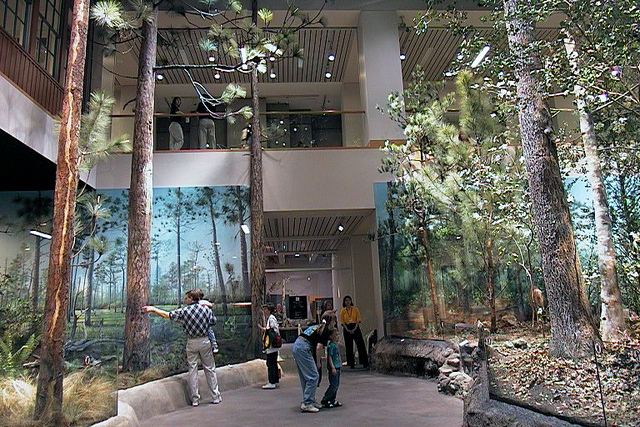 Descend back to the second floor and cross the bridge to the Nature Research Center. 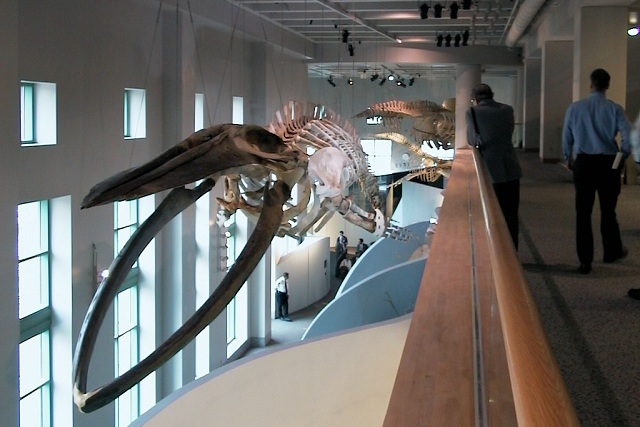 On your way, take a peek over the balcony at our impressive collection of whale skeletons—all species that swim off the North Carolina coast. But, to our consternation, visitors often think these behemoths are flying dinosaurs, or ancient birds. Really, we’ve heard them telling each other that. Let us know if you have creative ideas about how to help our visitors correctly identify them. 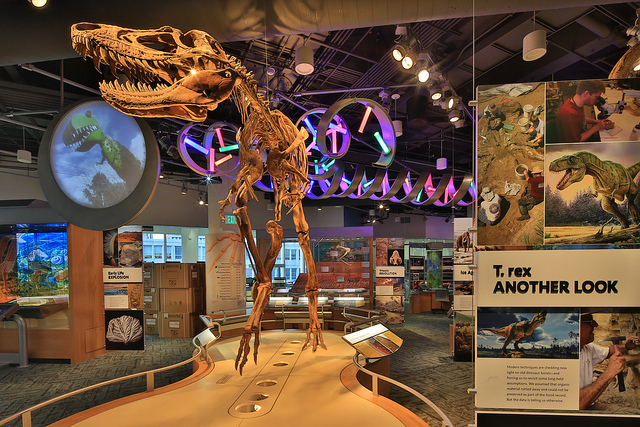 Now you’re in the Nature Research Center, our brand spanking new wing! 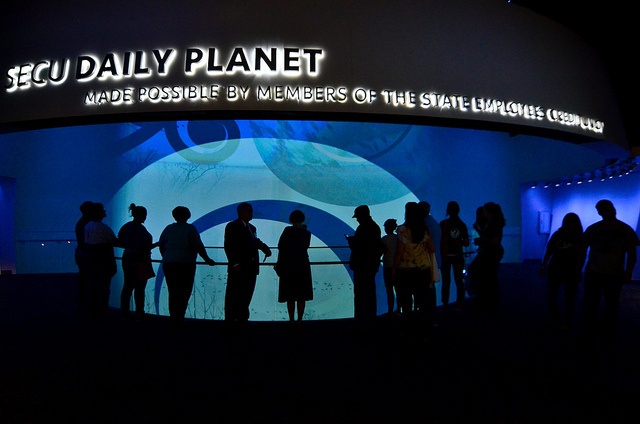 Check out the Daily Planet, our three-story theater. If there’s a live presentation going on, heckle your friends from the balcony. If not, indulge in your favorite Clark Kent superhero journalist fantasies for a moment and enjoy a few big screen science shorts. 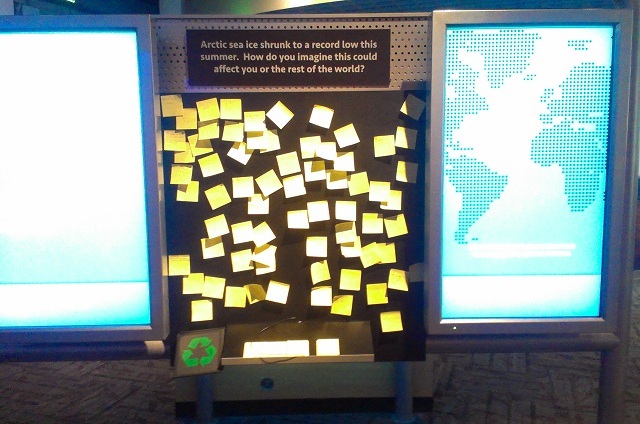 Turn around and explore our climate change exhibit. Leave your thoughts on the sticky note feedback board, but don’t forget that Twitter is watching you. And if you think you’ve got all the answers about climate change, challenge your friends to the mitigation simulator and see who can better avert catastrophe. Cruise through the second floor and peer in the windows of the Earth Observation lab. Please remember not to feed the scientists. Do not tap on the glass, as scientists are easily startled. Head upstairs to the third floor, making sure to admire the ribbon sculpture in the atrium and our giant microbes by the window. No, you can’t take one home. They bite, especially the rotifer. There’s a story behind that, if you’re lucky enough to catch Wendy or Helen at the conference. 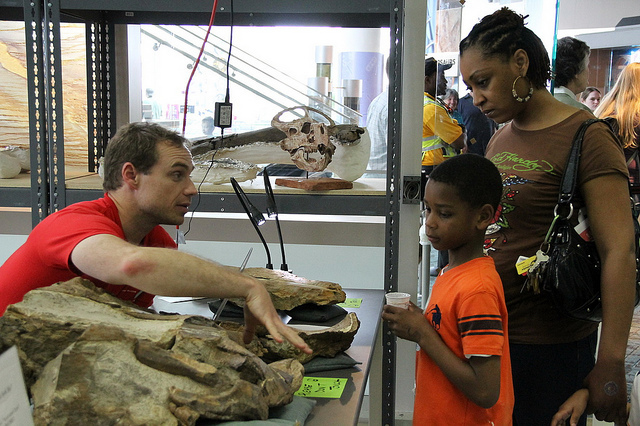 Explore the Ancient Fossils, New Discoveries exhibit. 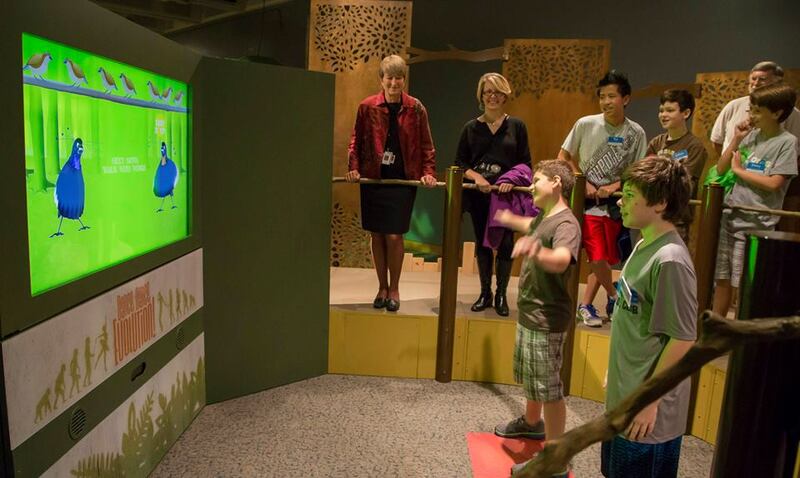 Part of this exhibit – the part decorated with a juvenile T. Rex – explores Mary Schweitzer’s recent research about the preservation of soft tissue in dinosaur fossils. This is big stuff, and definitely shouldn’t be missed. Be sure to check out our digital Ediacaran interactive, too. What looks like a boring old rock at first glance comes alive once you start seeing what paleontologists see. Peer in the windows of the Paleontology and Geology lab. Watch your fingers – paleontologists bite! 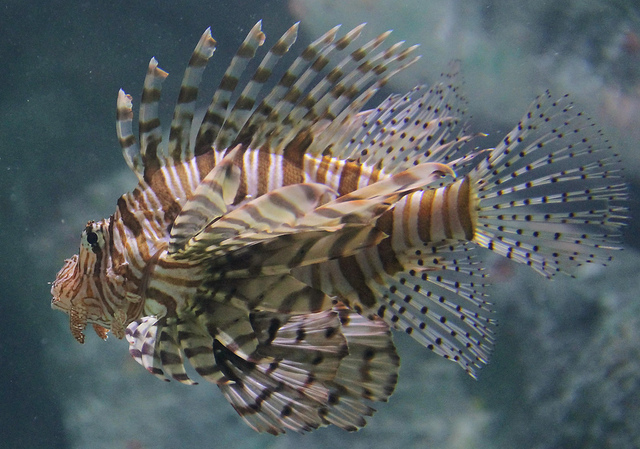 Descend to the first floor and check out our 10,000 gallon aquarium. When was the last time you went to the beach? Cross the first floor and take some time to explore the Science News, Your Views exhibit. We update this exhibit weekly with excerpts from our favorite science stories from newspaper, radio, and even blogs. Perhaps we even featured your work! Enjoy the ego boost, test your scientific vocabulary, and answer our survey question while you’re there. 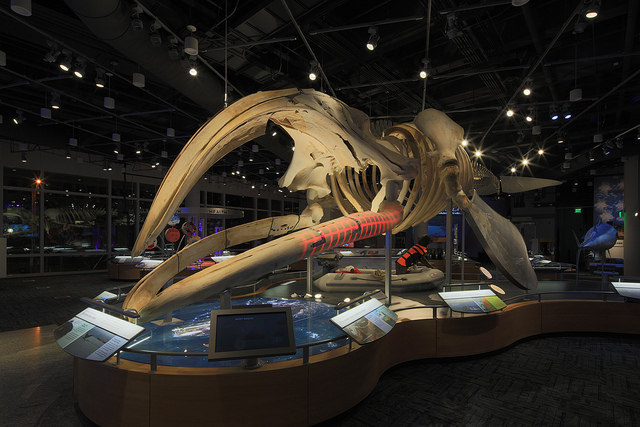 Finish your tour by visiting Stumpy in our Researching Right Whales exhibit. She’s hard to miss. Poor Stumpy. She was pregnant when she died after being struck by a ship, but a team of researchers made sure it wasn’t in vain. This exhibit is one of our favorite examples of scientific storytelling in the Museum, so be sure to give it a good look. Last year’s Science Online conference inspired lots of great blog posts and other feedback for the Museum. Let us know that you had a great time!